Spike your holidays with a splash of glitz! Our friend Marisa Fazzina is a New York City-based Makeup Artist known for her flair for gorgeous, fearless makeup! With that in mind, we called upon her to create Party All the Time, a new wet/dry eye shadow that has the perfect dose of fun and spunky sparkle for this holiday season! 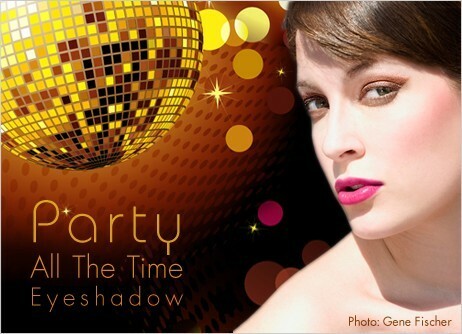 Party All the Time is a rich chocolate shade with bronze undertones, spiked with a hefty kick of opalescent shimmer. When applied wet with an eye shadow brush this finely milled eye shadow intensifies and lasts for hours. Line the eyes with Opaline Crème Eye Definer, finish with lots of mascara, and rock the ultimate Party All The Time eye look! 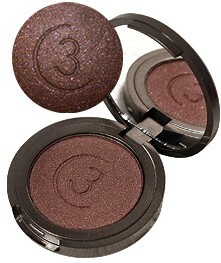 A rich chocolate shade with bronze undertones, spiked with a hefty kick of opalescent shimmer. (black with blue pearl) – Whereas some black eye liners tend to look grey when they dry down, cool opalescence makes this unique black appear “blacker than black” and the whites of the eyes look extra white. Cool, vivid fuchsia with a subtle blue opalescence. Full coverage creme!